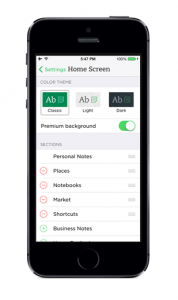 Evernote, the popular note-taking super app, rolled out new features for iPhone and iPad users Thursday that will let fans customize the app in new ways. Now users can hide sections they’re not using, while keeping those that they do front and center on the home screen. Simply go to settings and scroll through sections to add and delete your favorites. The New Note buttons were redesigned on the home screen, too, to stand out more. Users can also now select from among three color schemes: light, dark or green. Evernote also said it “stomped” out many bugs in the latest release, improved sync function, made the app faster and improved business card scanning. We fixed an issue that was corrupting audio notes on some occasions. The app will also fix and play audio files previously corrupted by this bug. We found and fixed lots of other bugs as well. This update is part of our ongoing effort to make our apps simpler, better and more reliable.